It is common knowledge that foods fresh from the garden are healthy and delicious. The salads that you frequently make can be transformed into a delicious smoothie using the vegetables that you are accustomed to. Lettuce, tomatoes, cucumbers, a little onion (or a lot in our world), maybe a radish or two. That's all there is to it! You may wonder why you would consider a smoothie instead of just making a salad? "It is true that you can receive the same amount of nutrition from a salad as you can from green smoothie recipes; however, the human body requires 3-4 servings of leafy green vegetables and fruits on a daily basis. Can you honestly say that you would like to eat 3 salads a day? The other primary problem with eating a salad instead of drinking Green Smoothies is that chewing alone is often insufficient enough to break down leafy green vegetables for the human body to fully digest. For maximum health benefit, supplement your daily salads with lovely servings of a Garden Smoothie. 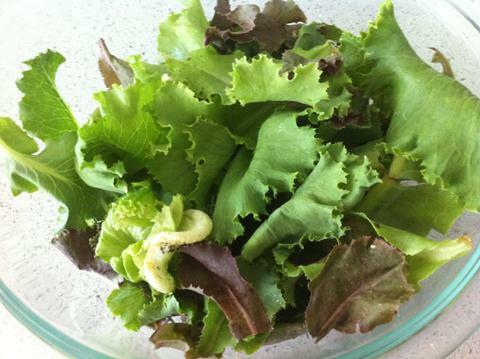 Choosing high quality, garden fresh food has the greatest impact on your end results. No matter how well you prepare it, if you start out with inferior food, you will end up with inferior results. That is simply a fact. Choose the freshest vegetables available (organic, if possible). Wash them well using an organic product designed for this purpose. Choose ripened tomatoes, smell them first! If they have no fragrance they will not become tasty in your dish. 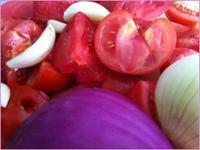 If using onions, select from yellow, white or red. We try and use a combination when we have them on hand. The darker the greens you choose, the better the health benefit. 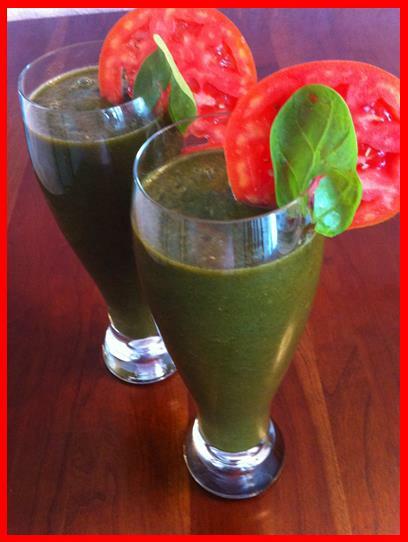 Choose dark Romaine, Red Leaf, Spinach, Kale or any other dark greens you like. A combination also works well. Garbanzo Beans, Artichoke Hearts, Avocados, Black Olives can be added according to your personal preference. Rough chop your vegetables and place them in your blender with the lightest weight foods on the bottom, add 1 Cup of water and turn your blender to "chop" (unless you have a high powered blender like a Vita-Mix). Now add your vinegar, salt and pepper, and ice cubes. Turn your blender to the "blend" speed until the ice is broken down, then change the speed to "puree." If you like it a little thinner, simply add more water. For a lovely change, add Tomato or V-8 Juice in place of the water, or for a spicy version try Spicy V-8 Juice. That's all there is to it! A fresh Garden Salad in a glass! Yummm.